The Gore Splattered Corner welcomes Kim Nekroman of the Nekromantix… – Stigmatophilia's gore splattered corner of insanity. Over at The Gore Splattered Corner we have been busy preparing for Halloween and as part of our celebrations we thought we would do something a little different and special to get everyone in the mood. 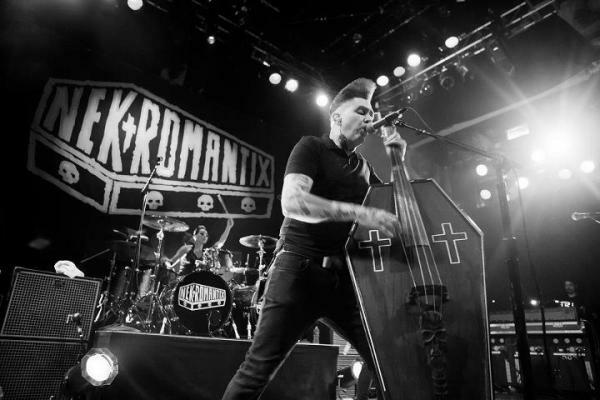 As part of this we thought we would step out of our usual comfort zone (in front of the TV watching films normally) to really embrace horror culture this month and what better way to start than inviting psychobilly legend, lead singer, frontman and bassist for the Nekromantix, Kim Nekroman to talk to us about his career and how horror has influenced him as an artist. It is an absolute honour to welcome Kim into our creepy little corner of the interweb. I have touched on music before (Todd Jason Falcon Cook’s Death Metal Zombies, and we also did a feature on Goretastic Music Videos), as there is a long running interplay between heavy metal music and horror, however psychobilly music takes this love of the creepy and macabre and really embraces it full force. In recent years, in some part thanks to social networking and places like YouTube, we have seen this unique blend of punk/rockabilly and horror movie themes rise its head proudly from the underground. Although it still remains largely an independent scene, where DIY ethics still matter and bands and fans unite to keep the scene going. However, and thankfully so, it is increasingly becoming more and more popular as it continues to capture the hearts of new fans from all over the world, with Kim Nekroman being a longstanding part of this movement for over 20 years, tirelessly touring, recording and connecting with his fans. Kim Nekroman with his wife Patricia Day (Horrorpops). 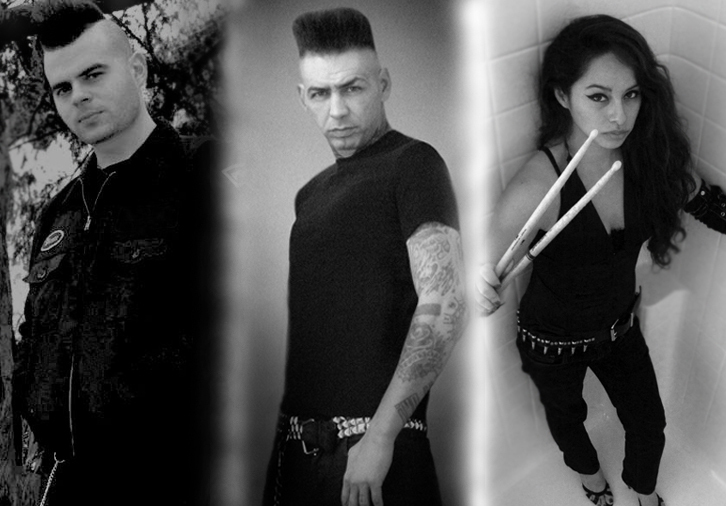 The Nekromantix formed in Denmark in 1989 (however they have since relocated to the States) and despite many line up changes Kim Nekroman still remains the frontman, main songwriter, and driving force behind the band. He has also been a long-standing member of the band his wife Patricia Day leads, The Horrorpops. As more and more bands come and go on the scene, Kim, and of course his signature coffin bass, remain strongly influential members of the psychobilly community and forerunners of the genre as it is today. Once described as ‘Elvis meets the Wolfman’ it is the Nekromantix cheeky song titles, punk rock energy and music which lives and breathes the spirit of 50’s B Horror Movies which has ensured the band go from strength to strength. I mean who can resist album titles such as Return of the Loving Dead, Life is a Grave & I dig it! Or What Happens in Hell Stays in Hell? Their infectious groove twinned with an ample dose of tongue in cheek lyrics provide enough fun to lighten even the darkest of hearts. Kim you are on record as saying you have had a love of horror films from a very early age how did that experience shape the performance artist you have become today? Obviously horror themes run rampant in psychobilly music, but you guys seem to take it to another level, what are your favourite all time horror films, and from where else do you draw your influences? KN: F. W. Murnau’s 1922 Nosferatu will always be my all time favorite. Nothing will ever top that movie. Runner up is Sam Raimi’s 1987 Evil Dead 2. I draw my influences from everyday life, news etc etc. Everything can be turned and twisted into a horror story in my world. Many of my lyrics are inspired by or based on innocent everyday life occurrences. I have to ask this, who developed the concept for the Horny in a Hearse video, and who did the animation? KN: The animation was done by the very talented girls Olya & Vera aka “The Mad Twins” from Ukraine. When I wrote the song, I knew that I wanted them to do the video. Together we came up with the characters and concept for the video. Was the band name inspired by Jorg Buttgereit’s controversial film Nekromantik? Where did the idea for the coffin bass come from, and have you ever faced any awkward questions getting it through customs? KN: When we did our first rehearsal ever, I set the goal of playing our first concert 3 months later. We did and a friend was video taping the show. At that time I was playing an “ordinary” upright bass, albeit painted white with blood spatter painted on it. I was watching the show and thought to myself: “man I need to come up with something different instead of that” and the CoffinBass idea was born. I remember our first ever US show in New York, customs asked me: “what is that?” This was around Halloween 2000 and I replied that it was a CoffinBass for Halloween…they look at me confused, shook their heads and waved me through. The Nekromantix have had a long history in psychobilly , and in recent years we have seen the scene become more popular than ever, how does it feel to be such an influential band amongst the community? KN: I am just flattered and grateful that I was given the opportunity to do what I love doing, to travel and see the world. That is a huge privilege that most people don’t have. Being influential is probably the biggest compliment anyone could ever ask for. KN: right now we are concentrating on touring. Hopefully sometime next year, will we go into songwriting and recording mode. Finally you are in the middle of touring right now, what will you be doing for Halloween, and any special plans? Upcoming shows: November 22 The Observatory with Reverend Horton Heat November 24 Ventura Theater with Wanda Jackson January-March US and Canada dates with Reverend Horton Heat (stay tuned for details). ‹ Hack ‘O’ Lantern Review (1988) aka Halloween Night, Death Mask, The Damning.